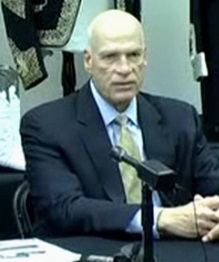 Zeek receiver Kenneth D. Bell at a Dec. 13 news conference in Lexington, N.C. Source: Screen shot from video at receivership website. The court-appointed receiver in the Zeek Rewards Ponzi-scheme case has announced he is in the process of sending a batch of more than 80,000 Notices of Claims Determination. This is the first batch of such notices, which the receiver began to issue yesterday. The first batch is expected to take through Dec. 31 to be fully sent. Zeekers not included in the first group of 80,000 should remain calm. More than 175,000 claims were filed in the Zeek case, Bell said in Dec. 13 letter. “We’ll be able to get, I think, more than 50 cents on the dollar back to people,” Bell said at Dec. 13 news conference. One or more distributions may come from the receivership. The first is contemplated for the first quarter of 2014, though more reconciliation work needs to be done before it is scheduled, Bell said. On the clawback front, Bell said on Dec. 13 that Zeek’s Top 10 net winners each received at least $900,000 from the Ponzi scheme. The biggest net winner received on the order of $1.8 million, Bell said. Clawback lawsuits are contemplated against roughly 9,000 net winners in the United States alone, Bell said. “They’re in all 94 U.S. District Courts, they’re in every state in the country,” Bell said. He noted that the U.S. winners have combined clawback exposure on the order of $200 million. Another 6,000 or so net winners are not U.S. residents and may have exposure of “several tens of millions of dollars,” Bell said. “We are trying to figure out who we can sue and where,” Bell said of Zeek’s international winners. Zeek operated through Rex Venture Group LLC of Lexington, N.C. The AdSurfDaily Ponzi scheme exposed by the U.S. Secret Service in 2008 brought in about $120 million and ensnared about 100,000 participants, also in less than two years of operation. Zeek, which launched after ASD was exposed and had promoters in common with ASD, appears to have brought in more than seven times the dollar volume of ASD while roping in about nine times the number of participants. More than $850 million was directed at Zeek, the SEC said last week. Zeek and ASD both operated MLM “programs” and had strikingly similar business models. Although ASD posed logistical challenges to the U.S. courts and victims seeking restitution, Zeek’s enterprise appears to have established an unprecedented challenge. On Dec. 20, federal prosecutors charged former Zeek COO Dawn Wright-Olivares and former Zeek programmer Daniel Olivares criminally, marking the first criminal prosecutions in the case. The SEC sued Wright-Olivares and Olivares civilly on the same day. The former Zeek pair settled with the SEC, agreeing to pay more than $11.4 million. On the criminal side of things, Wright-Olivares agreed to plead guilty to investment-fraud conspiracy and tax-fraud conspiracy. Olivares agreed to plead guilty to investment-fraud conspiracy. The SEC sued Zeek operator Paul R. Burks in 2012. Various Zeek probes are ongoing, investigators said last week. Bell said that most individuals who filed Zeek claims “did an excellent job.” He added, however, that some individuals filed “fraudulent claims” and that some “net winners” appear to have filed claims that state losses. “We want to make sure we’re not paying claims to people who ought to be paying the money back to the receivership,” Bell said. I sure hope that serial promoter Todd Disner is among the first to be sued. This SEC press release dated 23rd Dec appears to be an update to the one on the 20th. In light of their anticipated incarceration, no civil penalty will be imposed. I guess the only question is the number of years. The criminal charges are way overdue. What about the top promoters? Why should these people not be charged ,prosecuted, and if found guilty, I mean when found guilty sent to prison? One of the kingpins is this jerk called Coach Van from North Carolina who to this day continues to do internet ponzi scheme scams. The man is arrogant and knew Zeek was a ponzi deal. Bell needs to go after him and a lot of other Zeek promoters. He and the North Carolina AG can start right there where a few of the former Zeek big time promoters who made millions. Time to get tough Mr. Bell. Just get a couple of criminal convictions from the top promoters and watch the money come in from the other promoters who profited.